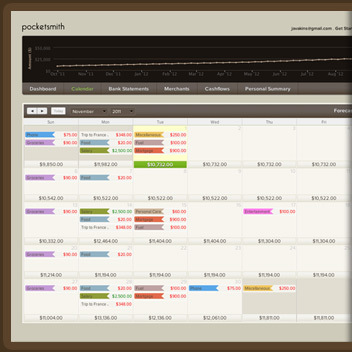 PocketSmith - Smart personal finance software. Remember bills, budget for the future, organize your money in a calendar. PocketSmith puts you in control of your money so you can focus on the more important things in life. You’ll be prepared for all your upcoming financial commitments, no surprises! The calendar lets you check any day's balance, months ago or years ahead. 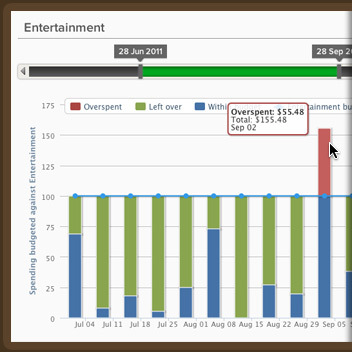 See historic spending and future payments; mark your paydays and bills. Eliminate the fear of the unknown! Stay protected by ensuring you'll always have enough for those unexpected surprises. Create a protective financial umbrella for you and your loved ones. I'm in love with @PocketSmith because it forecasts my bank balance for the future - so I know when I can afford what. PocketSmith helps prevent you from overspending, like a personal financial assistant. Sort your bank transactions into categories of your choosing. Once you assign spending limits and alerts to the categories, PocketSmith displays visuals that help keep you on track, and sends you email reminders. See a visual breakdown of what you're spending money on and be alerted when you're living beyond your means. Start saving! Fantastic software, better still it's #newzealandmade. Check out @PocketSmith to get control of your cashflow! Search through all your financial activities safely in one place, regardless of where you bank. PocketSmith can automatically download and store transactions from your checking, savings and credit card accounts. It also supports manual inputs and bank transaction files from all over the world. Explore your history and learn from your previous spending patterns. 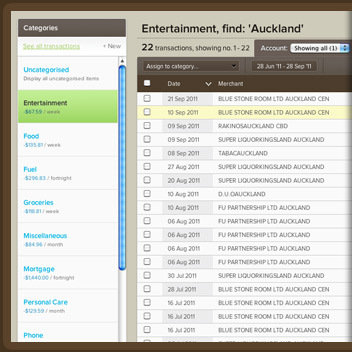 Quickly track down purchases and their amounts by merchant, category, date, value and more. Find out where your money went! For anyone who wants to plan their total budget with ease, I can't recommend @PocketSmith enough. It's yours to keep forever! Choose to upgrade when it suits you, no contracts. We invest in micro-lending to entrepreneurs from poverty-stricken countries. The RFP promotes professionalism in financial planning in the Philippines. It recognises and certified qualified individuals with the RFP ® designations who are in the field of financial planning.